I’ve come to realize I’m very adept at concentrating on work. So much so that this past week I found myself about 10 minutes away from being engulfed in flames. I was at my desk producing some sort of frivolous online advertising, and was apparently so engrossed in average typefaces and lilac gradients that I ignored the delicate pong of burning supper. From past experience I should know that by the time I smell burning at my desk supper is as good as briquettes. Which is why my diet is rich in charred perogies and frozen peas. Because on this particular occasion I was ambitiously constructing a curry I chalked up the smell to my adventurous concoction. I knew there was plenty of liquid in the pan and that it was only simmering on medium. What I forgot was that I had also put rice on 20 minutes prior. So when I casually walked into my living room I was unceremoniously greeted with a wall of blue smoke. I bolted for the kitchen and amidst wheezing, grabbed the charred pot and tossed it on the cutting board beside the stove. I Proceeded then to turn off all elements and started running around the apartment opening windows. It was at this point the smoke detector finally decided to do it’s job. Amidst the thick smoke, the wailing detector and the frenzied screams in my head I had the foresight to locate my camera and snap some photo’s. NB: if there are flames, I wouldn’t recommend this. 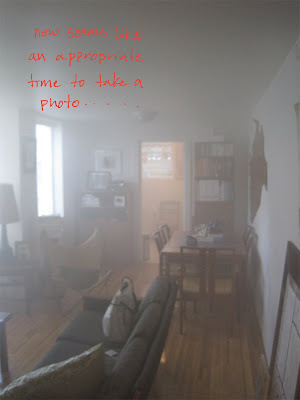 As I was adjusting the light meter I noticed there were still plumes of smoke billowing out of my kitchen. Armed with my camera I fought my way back to the stove, quickly realizing the cutting board I had set the pot on was now on fire. With the calm and precision of a very panicked flailing individual I grabbed the pot and tossed it into the sink and then decided to pitch the smoking cutting board out the kitchen window. It was at this point I saw my neighbors nervously peering through their blinds at my apartment. I casually waved to my fans and continued on in mayhem. My apartment reeks of smoke, and 5 days later I still kind of smell like campfire. Now I’m tasked with getting rid of the smell of burning. I’ve washed my walls and keep my windows open whenever I’m home, which recently is not often. I’ve solicited advice from friends, but since most of them are competent they haven’t had to deal with such a problem as permanent smoke damage. Mom however always comes through. So I have choices. 3) Put water and baking soda in an atomizer so as to mist the crap out of your environment. This too I believe has something to do with smell absorption. 4) And this is my favorite. Put a couple of drops of your favorite perfume on a light bulb. If I’ve got this right, to get rid of the smell of burning I need to start an electrical fire? I understand the theory behind this asinine idea. But I refuse to drizzle a flammable substance on light bulbs throughout my apartment. They as well have suggested dousing myself in lighter fluid then lick a light socket. Worst case scenario, I won’t get my damage deposit back when I move out next month. A lick of paint and a blowtorch will take care of the rest.